Tired of car sales stereotypes? Get rid of the sleazy reputation once and for all. These 9 scripts will help you combat the most common stereotypes and start selling more, TODAY! Car buyers have gotten smarter, but they still make negative assumptions about auto sales people. 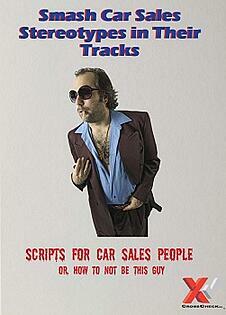 To keep vehicles moving off the lot, you need to have the right scripts when dealing with car buyers. Fear not, that's why we created a free guide. How to stop a lot bully in his tracks and even convert him to a sale. Show off all of the research and technique that goes into your job. Girl power! Why women are some of the most successful sellers.